The russet-backed oropendola (Psarocolius angustifrons) belongs to the family of New World orioles and oropendolas, the Icteridae. The russet-backed oropendola species is distributed in Venezuela, Colombia, Peru, Ecuador, Brazil and Bolivia (South America). Males of these oropendola species are larger than the females. These oropendolas are polytypic species. The russet-backed oropendola (Psarocolius angustifrons) is a medium-sized oropendola. The male measures 45 to 50 cm and female measures 35 to 40 cm in length. The mean weight is 220 grams. The russet-backed oropendola has overall olive and brown plumage. The upperparts are dark brown in color with a reddish-orange tinge. The tail is long, brown with contrastingly yellow outer rectrices. The wings are blackish brown. The bill is long and sharp. The nominate subspecies has black bill, whereas the other subspecies have pale yellow-orange bill. The irises are blackish brown. The legs and feet are dark gray. Their call is a load squalling, barking sound. These russet-backed oropendola species are distributed in Venezuela, Colombia, Peru, Ecuador, Brazil and Bolivia. There are six recognized subspecies. 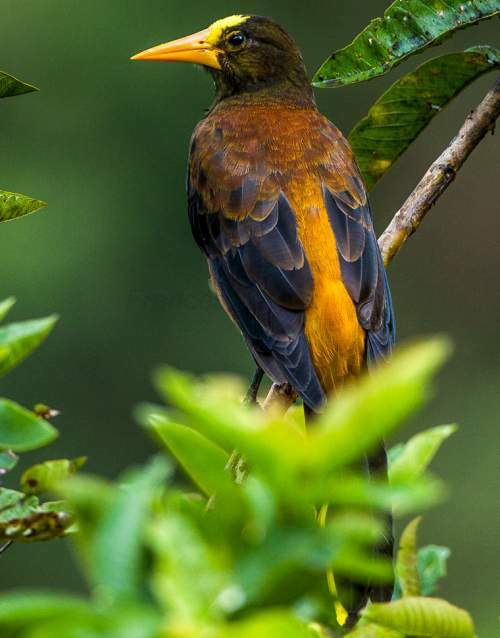 The nominate subspecies P. a. angustifrons (black-billed oropendola) is distributed in Andean Mountain foothills in southern Colombia, eastern Ecuador, northeast Peru and western Brazil. 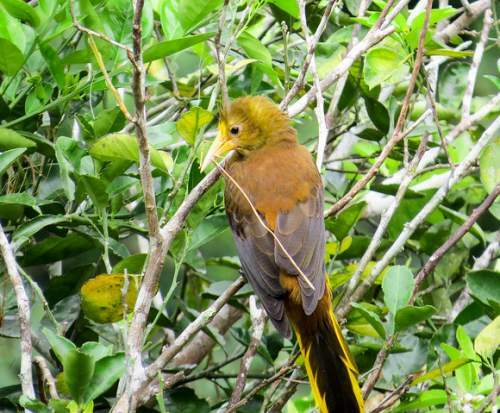 The subspecies P. a. alfredi (yellow-billed oropendola) is distributed in eastern slopes and foothills of Andean Mountains in southern Ecuador, Peru and central Bolivia. The subspecies P. a. salmoni is distributed in western and central Andean Mountains in Colombia. The subspecies P. a. neglectus is distributed in Colombia–Venezuela border and western Andes of Venezuela. The russet-backed oropendola subspecies P. a. sincipitalis is distributed in Andean western slopes in Colombia. The subspecies P. a. atrocastaneus is distributed in the Andean western slopes in Ecuador. These russet-backed oropendola species have moderate forest dependence. They normally occur in altitudes from 0 to 1500 meters. 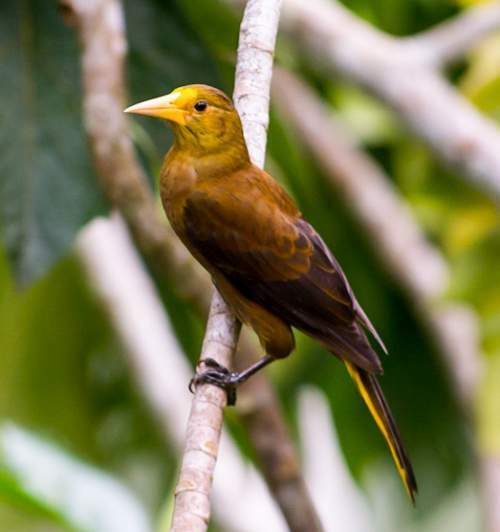 The natural ecosystems and habitats of these oropendola species include tropical and subtropical moist lowland forests, floodplain-forests, swamp forests, tropical and subtropical moist montane forests and foothill forests. The diet of these russet-backed oropendola species consists mainly of fruits. A variety of wild fruits, seeds of wild plants, fallen fruits and large insects are their primary food. The breeding season of the russet-backed oropendola nominate subspecies is from September to March in Colombia. The laying season is from June to December in Bolivia. These species are monogamous and colonial breeders. The nesting sites include lower horizontal branches of trees. Their nests are long, woven, hanging baskets suspended form the end of the branch of a tree. These russet-backed oropendola species are non-migratory resident birds. The populations in the higher altitudes may move to lower levels in winter. Post breeding, the juvenile oropendolas may disperse and establish in new locations within the range. Within their range they may make local movements for feeding and breeding. The global population size of the russet-backed oropendola (Psarocolius angustifrons) has not been quantified. The overall population trend of the species is considered to be decreasing. 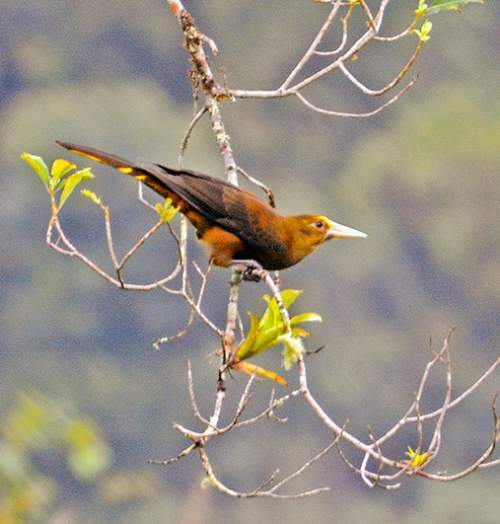 In most of its range, this oropendola species is reported as common to uncommon. The generation length is 4.6 years. Its distribution size is about 4,430,000 sq.km. 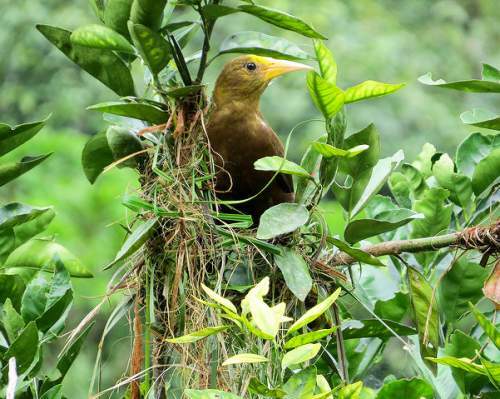 Habitat alteration, fragmentation and destruction, human intrusions and disturbance and deforestation are the main threats that are endangering the survival of these oropendola species. The russet-backed oropendola (Psarocolius angustifrons) does not approach the thresholds for being Vulnerable, either under the range size criterion, or under the population trend criterion or under the population size criterion. The CITES (Convention on International Trade in Endangered Species of Wild Fauna and Flora) status is ‘Not Evaluated’ for the russet-backed oropendola (Psarocolius angustifrons). The russet-backed oropendola (Psarocolius angustifrons) is closely related to the green-billed oropendola (Psarocolius oleagineus). P. a. sincipitalis (Cabanis, 1873). Current topic on Birds of South America: Russet-backed oropendola - Psarocolius angustifrons with photos.